The Orlando Magic always make an extra effort to increase their immense number of off-the-court endeavors around the holiday season. 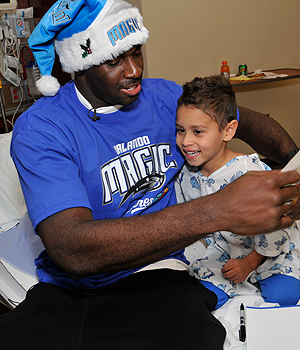 Prior to heading on his team’s west coast trip, the Magic’s Brandon Bass paid a visit to pediatric patients at Florida Hospital for Children to spread some holiday cheer. The 6’8” power forward did his best impersonation of Kris Kringle, donning a Magic-themed Santa cap as he popped into the rooms of countless children throughout the evening.